Two coal miners say they quit Massey Energy's Upper Big Branch mine in the final months before an explosion because they thought it was going to blow up. A third miner -- who had worked at the mine for 13 years -- called Upper Big Branch "a time bomb." But Massey officials say samples showed the air was safe just before the blast. Federal inspectors cited Upper Big Branch four times this year for problems with ventilation systems designed to dilute methane, and three times for a buildup of combustible material such as coal dust. Inspectors said all seven incidents were reasonably likely to cause serious injury. One miner who quit Upper Big Branch before the blast said, "Basically what they've done is created a massive bomb underground. I knew it was going to happen." The man, like two others who had worked at Upper Big Branch, did not want to be named. He said he feared being blackballed from other jobs in mining, West Virginia's dominant industry. Another miner who had worked in a section affected by the explosion said methane levels frequently set off detectors, forcing the automatic shutdown of a coal-cutting machine. Using mining lingo, he said the machine "gassed off all the time -- three, four, five times a shift." At a news conference Monday, Massey officials insisted that they run safe mines. Board member Stanley Suboleski said pre-shift inspections found nothing wrong before the blast. "No hazards were found, and methane measurements ranged from zero to nearly zero," Suboleski said. "There was no indication of a dangerous condition, yet only a few tens of minutes later, the explosion occurred." Massey CEO Don Blankenship said the company still doesn't know what caused the blast. He insisted that safety always comes first at Massey and that he set up programs long ago to ensure that. "The naming of those two programs speaks for itself: S1 -- safety is job one; P2 -- production is job 2. That's been the case for my entire tenure," Blankenship said. Some former Massey workers say Blankenship has it backward. "It's supposed to be safety first, but to me it was production first," said Teddy Cole, who spent a dozen years working at Upper Big Branch. Brian Jerrell, who worked for Massey between 2000 and 2002, agreed. "A lot of times, it's production first and safety third," Jerrell said. Adam Vance, who worked two Massey mines off and on over the past few years, said Massey viewed the bottom line as paramount. "They cover [themselves] with their safety meetings, but the main thing Massey's out for is to get that all-mighty dollar," Vance said. "If the coal ain't running, they ain't making no money." All three said the company talks about safety, but underground, it's all about getting coal. Bobby Inman, who has served on Massey's board since 1985, said Monday that the idea that the company put profits over people is absurd. "It's a big lie," Inman said at the news conference. Inman said Massey's enemies, including resentful unions, have been pushing the idea in the media for the past several weeks. "And where did this big lie start? The first came from a plaintiff's lawyer, the second from the president of the AFL-CIO, the third from the president of the AFL-CIO, the fourth use of it from the president of the United Mine Workers." Actually, Blankenship fueled this idea himself in a 2005 internal memo. "If any of you have been asked by your group presidents, your supervisors, engineers or anyone else to do anything other than run coal (i.e. build overcasts, do construction jobs, or whatever) you need to ignore them and run coal," the memo said. "This memo is necessary only because we seem not to understand that coal pays the bills." Ron Fluty, a former Massey worker, union member and retired federal mine inspector who inspected Massey mines for three years, said the memo calls for workers not to build structures like overcasts, which help funnel air to the working section of the mine and dilute methane. "This is pitiful," he said. "You know, a lot of times, I've thought this ... went on ... but to see this and read it, to me, it's totally devastating." 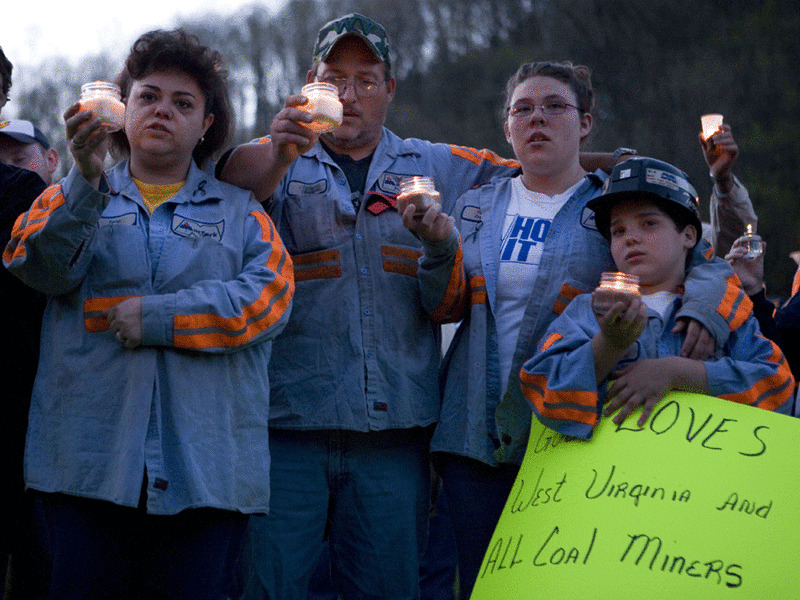 The memo became part of a lawsuit filed in the deaths of two miners at a Massey operation in 2006. A Massey subsidiary eventually pleaded guilty to criminal charges in the case. Blankenship has said the memo was taken out of context. A week later, he sent another, clarifying memo, saying safety was not "a secondary responsibility."